The Porsche Cayman is an impressive rear-wheel drive sports car. The Cayman is based on Porsche’s popular Boxster model and is available in coupe form. 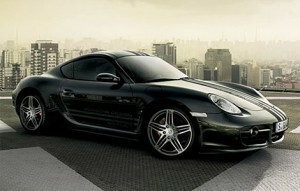 The Cayman provides an excellent driving experience as buyers have come to expect from Porsche. The Cayman is easy to drive and fast, yet the firm didn’t sacrifice comfort for performance. The Cayman represents a good blend of sports car driving experience and modern day comfort. The Cayman delivers more traditional driving dynamics and is sure to please even the most demanding driving enthusiast. The Porsche Cayman is not so powerful that drivers could get themselves into any real trouble but an enthusiastic driver will definitely appreciate the Cayman’s performance on the open road. The little two-seater is attractively designed with styling elements that have been borrowed throughout the Porsche line. The Cayman is a supercar but still manages to handle day-to-day tasks with great competence. The Cayman’s engine was modeled after that of the Boxster and the 911 provided a model for other enhancements resulting in improved performance and handling. The Porsche Cayman will be an expensive purchase. Insurance rates will be high and so will fuel costs and maintenance. The Porsche Cayman is not for buyers who are on a tight budget. Residual values should remain high. The Cayman is a two-seater but can easily and comfortably accommodate two full-size adults. Headroom is good and the Cayman’s rear boot space is good for a car of this size. Additional storage space is available in the Cayman’s nose area due to the rear engine mount. The Cayman’s instrumentation sports Porsche’s new attitude on clear and intuitive switchgear. The main dials are large and functional while the Cayman’s speedometer is digital. Everything is practically placed and easy to find. The Cayman delivers a comfortable ride on most surfaces and the car’s seats are supportive but not too firm. Road and wind noise have successfully been minimized and although engine noise is prevalent it is not likely to annoy a Porsche enthusiast. The Cayman is not a large car by any means, but extra care should be taken while parking. The Cayman’s nose is longer and can be difficult to judge with limited visibility due to the car’s low seating position. Rear visibility is also limited thanks to thick pillars and wide alloy wheels make it important to exercise caution to avoid kerbing the wheels. The Cayman provides a good in town driving experience and on the open road it provides a fast, involved, and very satisfying experience. The Cayman is a notch above its rivals in many ways. The Cayman provides excellent grip and steering. The Cayman’s engine is never short of power or enthusiasm making this a very exciting car to drive. The Cayman is an unlikely family car. The car only boasts a two-seat layout and boot and storage space is very limited. It is easy to see how the Cayman could function as a fun second or even third car for a family. The Cayman is not a good first car. It is too expensive and provides too much power on hand for most novice drivers. The Cayman can also be difficult to park for a driver who is inexperienced. There are better first cars available even for those new drivers who could afford it. Porsche has a strong image for building quality sports cars. The Cayman is no different with a quality interior build and feel and sound mechanicals. Demand is likely to exceed supply with the Cayman and that is fairly trademark for Porsche. The Cayman’s standard security features include remote central locking, an engine immobilizer, and a security alarm. A tracking device might be a good idea as well given the Cayman’s kerb appeal. The Cayman comes standard with an array of airbags, traction and stability features, and the ability to turn off the traction and stability aides while driving on a race track. The Cayman comes standard with a quality audio system that produces excellent sound quality. There are many upgrades available including a colour sat-nav system with a large screen and a mobile phone unit. The Cayman is available in several exterior colours. Yellow is good for those who really want to stand-out but silver looks better on the Cayman and gives it a classier look. The Cayman’s interior is predominantly black. The Cayman is a unique and welcome driving experience from Porsche. Despite the fact that it was inspired by several other Porsche offerings the Cayman is a totally unique experience. 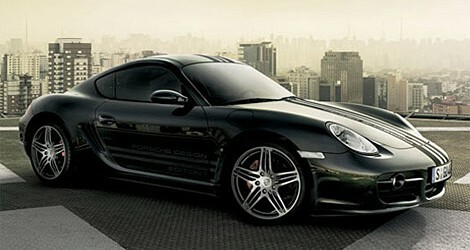 Porsche has managed to take the best elements from other models and combine them into one impressive sports car. Buyers will not be disappointed.